Oh that flirtatious little dandelion. It’s Valentine’s Day coming up and I bet when you think of flowers and romance you envision red roses. But there’s another unappreciated plant that would also fit the romantic flowers category, though when I tell you what that plant is you might not believe me. If anything this plant probably brings to mind childhood play times in the grass, fairies, wishes, free snacks for pet rabbits and if you are like my husband, sheer loathing. As the designated person in charge of the grassy areas on our property, this plant is a thorn in his side. To be pulled and discarded at first sight. It’s not something he wants in his garden (not that the dandelions care about those wishes), no doubt any romantic connotation is far from his mind when he sees one. But if you look up the symbolic meanings of this plant, then you might be in for a surprise. For something so supposedly unwanted, the results sure are poetic and beautiful. There’s more than one meaning for this plant, and I shall focus on only one for this post. One that is quite appropriate for a certain popular day that’s coming up, Coquetry. The definition of coquetry is “a flirtatious manor or flirtatious behavior”. And by plant I mean a very well known garden weed. This fluffy little guy. That flirtatious little dandelion puff n our garden… It’s floriography meaning is coquetry. Yup that’s right I am talking about the dandelion. Dandelions are flirty. Bet that’s not something you would have ever thought before reading this. And if we are really honest, a lot lot cheaper than the Valentine’s Day standard of red roses. But somehow I don’t think my husband will take up giving me dandelions as tokens of affection. And the real thing whilst quite pretty once gone to seed is quite quite delicate. One breath, or sneeze and you’ve got a bare stem. This little, delicate and fun garden weed, with its surprising floriography meaning inspired me. So I broke out the green ink again. drawing in green ink, with a dropper. This is how my inkblot art starts. And I started making some green grass inkblots. Fresh green inkblots before the details of the flower have been added. This time I went with silver pen instead of gold like the roses. I felt the silver suited the green and the dandelion puff much more. Close up of the silver details being added. After a few stolen work minutes here and there I finally had something finished. 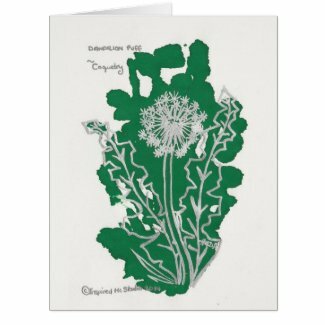 Coquetry Floriography Inkblot of the Dandelion. Finished piece. I am pretty happy with how it came out. It even looks good in a white frame. And as I have enjoyed creating these inkblots, and learning about floriography so much, I am going to set you all the challenge to join me. Lets blow up our social media with beautiful flowers, plants, and beautiful sentiments. We can fill the internet with secret messages and learn about floriography together. I want you to share pictures of a plant or flower in your feeds be it facebook, twitter, Google+, Tsu, Pinterest, or even Instagram. It can be a photo or even a picture you drew or created. Along with the flower or plant’s name, it’s floriography meaning and the tag #FloriographyInkblotInspiredMe so we can all see see it. Come on lets communicate through flowers and plants on the internet. It will make a pretty change in our news feeds from the usual image content we see and share, and you might find some of the meanings surprising. I’m looking forward to seeing what you share. Happy Valentine’s Day everyone. May your days be filled with coquetry and love. Are you having a Merry Christmas?